Jai Singh was passionate about two things-arts and the sciences, chiefly astronomy. Once, at the court of Muhammad Shah, he found the Hindu and Muslim astrologers embroiled in a heated argument over certain planetary positions. It was imperative that the positions be known accurately to determine an auspicious hour for the emperor to set out on an expedition. Jai Singh offered to rectify the then available astronomical tables, an offer that was readily accepted by the Mughal emperor. The result was an onsite Jantar Mantar in Delhi, an astronomical observatory where the movements of sun, moon and planets could be observed. Jai Singh's idea was to create a rebirth of practical astronomy among the Indian masses and practicing astronomers. 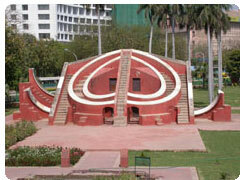 However, the lofty ideals of the Jantar Mantar remained unfulfilled as the country at that time was in chaos and the full potential of this observatory was never realized. In the beginning, Jai Singh tried to use brass instruments in this observatory, but soon gave them up because of several inherent flaws. They were too small, for one thing, their axes were unstable so the center often got displaced. He then decided to follow the style adopted by the renowned Arab astronomer, Prince Ulugh Beg, builder of the famous 15th century observatory at Samarkand, Uzbekistan. The massive masonry instruments at Samarkand suited Jai Singh's architectural tastes and promised to be more accurate because of sheer size. In 1730, Jai Singh sent a mission to the king of Lisbon. On its return to Jaipur, the mission brought back a telescope and the court astronomer by the name of Xavier de Silva.